In the past year, I have had a few chances to play with Google Earth and try out some of the amazing tools that come with the program. For the Social Television class I took at the MIT Media Lab, I used placemarks, 3D buildings, and zooming animation to create the software demo for our final project. 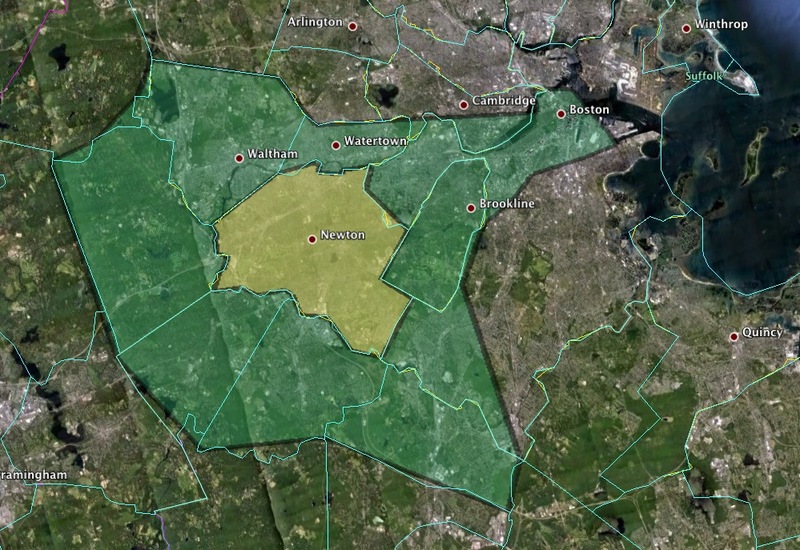 More recently, I was able to use Google Earth to create Craigslist coverage maps that show the rough boundaries of the five Craigslist areas in Massachusetts. How did I make the different-colored areas in Google Earth? By using overlays. It's a drawing function that lets users trace points on a map with a mouse. Once the points are joined, the area looks filled in. Different colors and transparencies can be applied, which lets overlapping areas be clearly shown (see the Invantory blog post, above for an example of overlapping overlays). Google Earth is a free download. I recommend using a reasonably recent and powerful desktop computer, as it uses lots of processing power to run and render sophisticated 3D images.